We had a music accident the other day. We were practicing for a Valentine’s Day party, and we were excited, because, well, it’ll be musica romántica. And what could be more fun than learning or re-learning beautiful music for a three-hour gig? We were deep into a rehearsal when The Guitar Player’s pick was mistakenly but enthusiastically thrown across the room. In an effort to protect the drum machines (we use drum machines), they were bumped off their stand, and hit the tile floor. 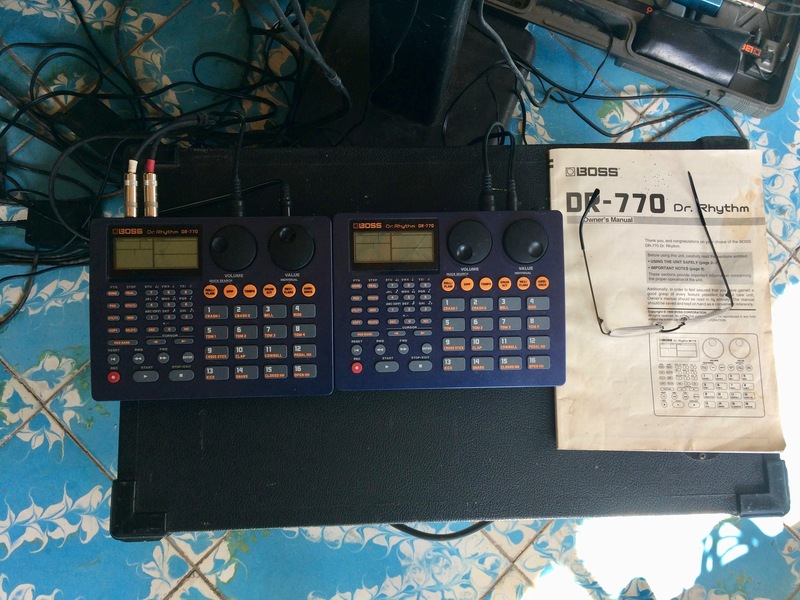 These were no ordinary drum machines. They’ve been programmed to hold the rhythms and tempi (speeds) of hundreds (really!) of songs we play. And they’re (ahem!) vintage. If you’re interested, I can name models and ages. The older one broke. Some outside parts (little feet, sliding adjuster knobs) broke, and something inside broke, too. The rehearsal was, well, over, and The Guitar Player began to look for whatever was causing the machine to not work. We were making plans to visit La Plaza De La Tecnología in León, or to call a friendly repair guy we know in León, or ? There was a teensy little copper coil inside (OK, it had been inside, but wasn’t any more). We swept the floor. We looked underhand on top of furniture. Finally The Guitar Player took the rest of the guts of the machine apart, and – gasp – he found it! But that didn’t solve the problem. After all, it was broken. We have a back-up drum machine, wisely purchased from eBay a couple of years ago. We studied the manual (yay! we had a manual, and we found it!) and remembered that there was a way to dump all the sounds and all the patterns/songs into another device or into the other drum machine. It’s two days later, now, having had to take a day off of practicing to play for a church service in a nearby town. End of first little story. Two drum machines “talking to each other” via midi. So what are we doing today? The Guitarist/drum machine programmer/composer/singer extraordinaire is getting together a few (a few hundred!) seed and fertilizer bags that a neighbor wants to buy (one peso apiece). And I got a chance to get into the kitchen and make something good. I felt liking creating a memory of meals out of my past – something comforting to help us get past our musical accident and some disturbing personal financial news from California. Beginning of second little story. 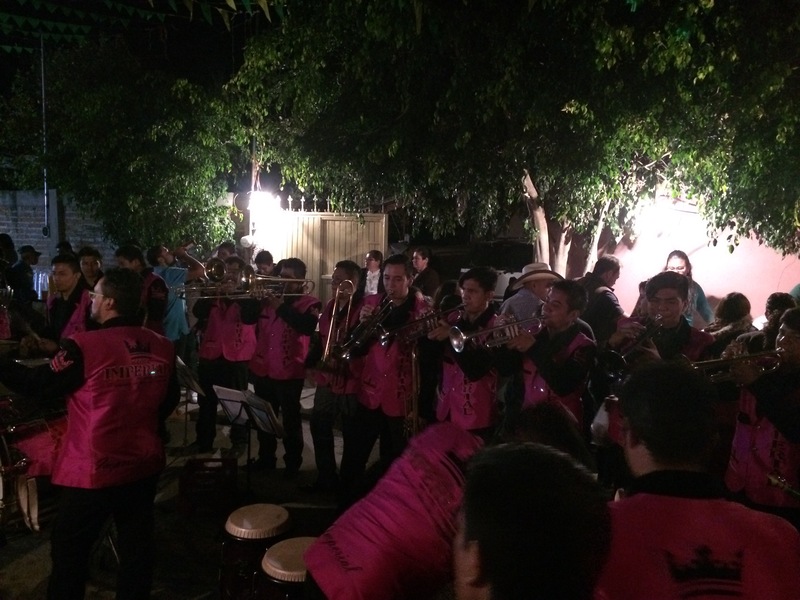 A couple of years ago we were invited to play a few hours of music in a big fiesta nearby. The woman who had contracted us is a friend. We finished the night, marred as it was by a gang group of young guys who have a history of (sometimes violent) differences of opinion with the town we were in, and who had been making comments and throwing bottles. We didn’t have to hide behind our speakers as we have on various occasions, (don’t ask!) but we were tired that night anyway. It had been stressful, and the sound we got from our system wasn’t as we had hoped – things like that can really tire you out. We were invited to our hostess’ house for a late night supper following the gig. She said, “I made a nice cream of squash.” I wasn’t exactly sure what that might be, but running through my mind was,”Cream of squash? Pumpkin? 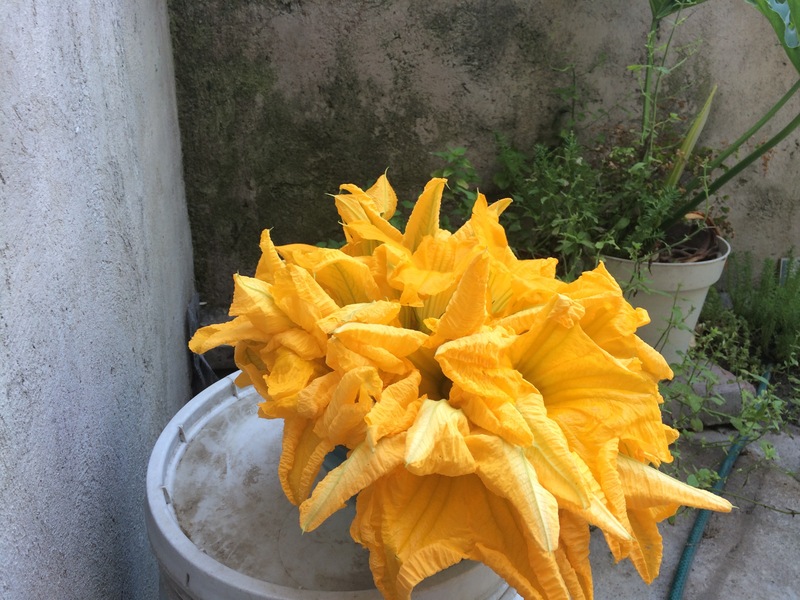 Yellow squash? Zucchini?” but we couldn’t politely refuse. And besides, we like her, and her very, very pleasant old style mother. 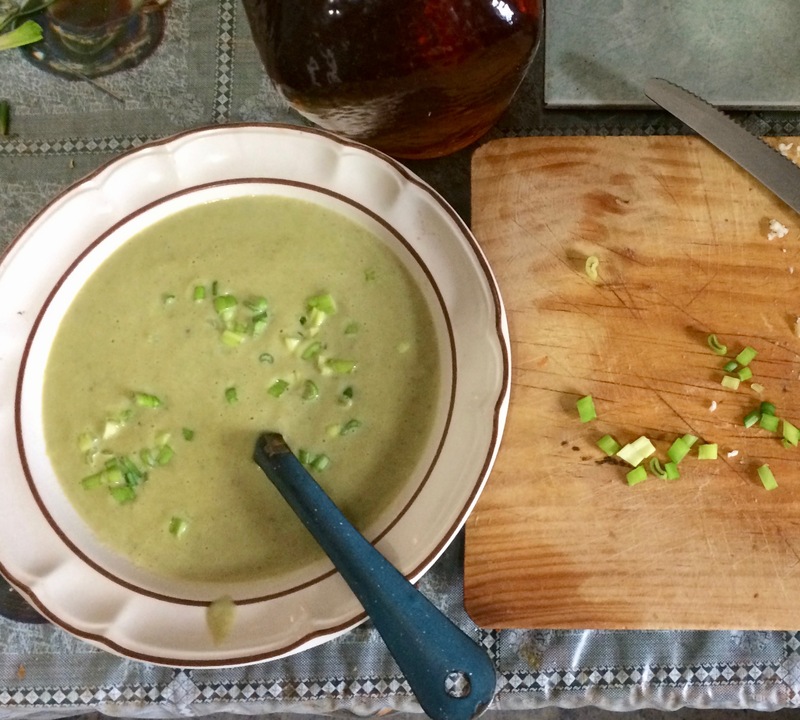 We sat at their comfortably large table in the comfortable kitchen (probably not like anything you might be imagining) and she served us bowls of pale green soup. I hesitantly tasted it, and goodness! it was absolutely delicious! After awhile (another bowl, please), I asked how she had made it. It sounded extremely simple, and I imagined that she must have left out some steps. But here’s a very, very similar recipe I recently received from Mely Martinez by way of her blog called Mexico In My Kitchen. Don’t worry – I’m not trying to make this a food blog (I save that for my sister)! Soapbox: (hah! I wrote soupbox first!) I’m a native Californian (a small minority), and proud of it. Californians are familiar with Mexican food. And here comes the opinion: most Mexican food you may eat at a restaurant or at a potluck (all of which I’m inordinately fond of), just isn’t what you might find in a Mexican town. As much as I enjoyed my mother’s homemade enchiladas, with tomato sauce, canned green peppers and Jack cheese, they just weren’t like enchiladas I’ve eaten in Mexico. Too much cheese! (used in Mexico more as a flavoring)! Too much tomato sauce! And when I search for authentic recipes, they’re not readily available, in my opinion, unless they’re in Spanish (and then, not always). End of soapbox – returning to the topic. I’ve jealously attempted to create salsas and foods like the ones you can find in any little Mexican hole-in-the-wall restaurant, with some successes and many not-so-successful attempts. So I was pleased to see this recipe. In English. It looked so similar to the way my friend described making Crema de Calabaza. It’s so simple that you may not be attracted to it (just like I wasn’t), but I recommend making this for you and your family when you’re tired after a long gig, or a disappointment. It’s perfect for a medium-sized party. It can stand alone, with toast, bread, or cheese, or maybe a rice dish. It can be a first course. It’s smooth. It’s delicious. It’s creamy. I really, really like it. The ingredients and instructions are simple, and there are clear photos to help you if you have any doubts. This blog photo is so much prettier than mine, but the flavor of mine was just as good! Swear! Hope you can tell. 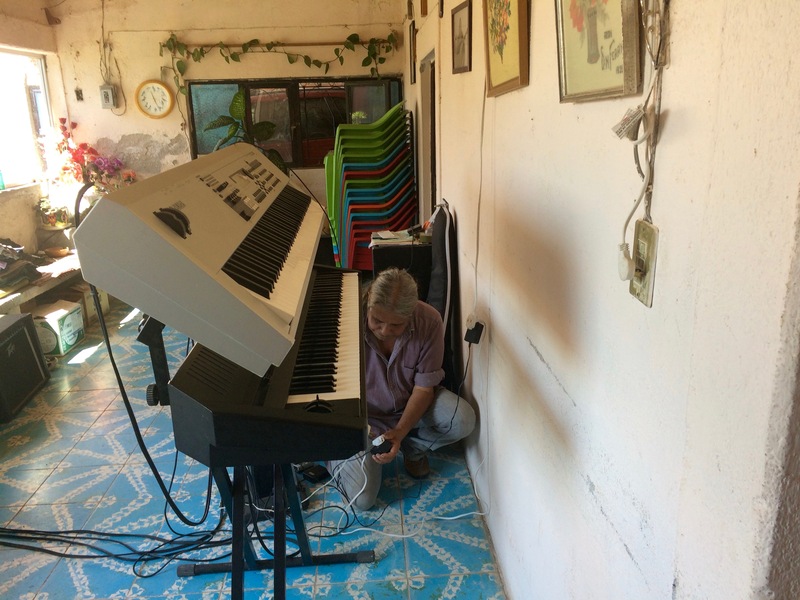 This entry was posted in food in Mexico, gringos in Mexico, Mexican food, parties and fiestas in Mexico, performing musicians, retirement in Mexico, small town life in Mexico, Uncategorized on February 4, 2017 by gubabbaboy. I say that today was unique for several reasons. We are jack-of-all-trades musicians. (Can I say that?) We play for religious ceremonies, dances, and special events of all kinds. 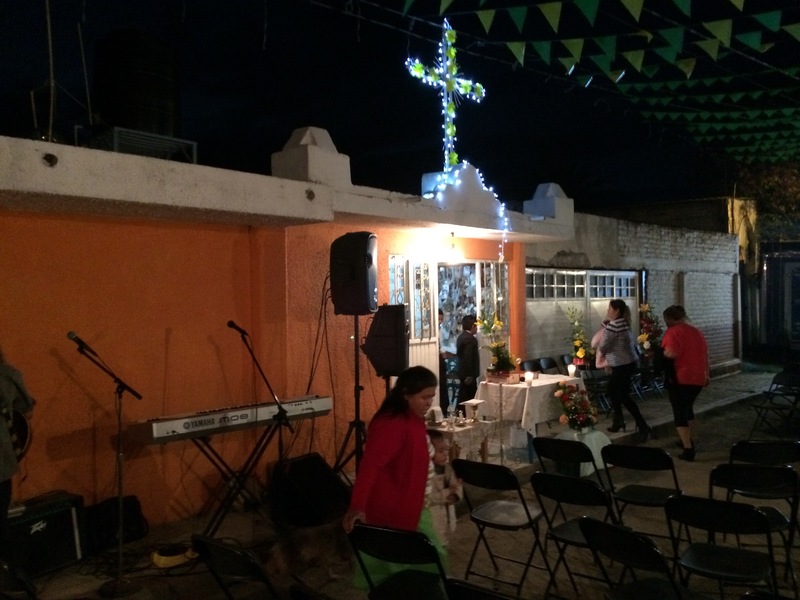 We played for a mass in nearby El Tecolote, and it was an occasion that we had not played for before: it was a mass for San Juditas, a familiar name for San Judas. Saint Jude, patron saint of lost causes. This saint is popular in Mexico City, and people make pilgrimages to temples dedicated to him all over Mexico. Unique. We were told that there is a temple dedicated to this saint in El Tecolote. In a house. Unique! There’s a story told to us with little detail. An owner of the house promised San Juditas that he would make and dedicate a temple to him if he would answer a prayer about a desperate situation that was affecting him. The temple bears witness to the answered prayer. It’s inside a house on a street near the edge of the town. They say that at one time the house was the very last house in town. Now the street boasts several more houses, and as we came to surmise, the houses belong mostly if not completely to descendants of this man. It’s their own family neighborhood! The houses in this area are different in that nearly all of them can be shut completely up. The entrances are very large solid metal sheets fashioned into gates by practiced metal workers. .Some have people-sized doors cut into them, but most of them are just enormous doors or gates, opened only enough for people to slip in and out. There is no view at all of the house for the curious. Here’s another unusual thing, if not unique – we drove our big truck. It’s a large old panel truck that’s big enough to carry large equipment for playing for a couple of thousand people. One might ask why we took it. I’m really not sure what provoked that decision, but as we were leaving (it’s tricky getting it out of our parking in the back lot) I noticed that the brake pedal was squishy, and I announced it. Chon said we would get brake fluid tomorrow. After we loaded up our regular equipment (that can ride comfortably in the back of the PT Cruiser) we drove about a mile to the turnoff for El Tecolote, and headed down the narrow paved road leading to the town. We asked for directions. Down there, a woman said. Turn right after the second block. And that’s where we came right up on vendors! and lots of people milling around! By this time, the brake problem had reached noticeably scary levels. We drove right up to the vendors’ stands, and an enormous piece of plastic that covered most of the street. After the unfortunate mirror incident, I unhappily backed up the truck onto the main street again, and went further to the bottom end of the town. A lovely woman approached, smiling, and said yes; at the next street turn right. It will be much easier for you. It was a narrow street that looked like it ended right away, but it didn’t – there was just a sharp curve that we couldn’t see around. So we made it almost to the house-that-is-a-church, and parked. In front of our truck was a castillo; a fireworks tower, so we couldn’t go any further forward. A butcher in his apron came over to us and said he would get people to help us carry the equipment right to the door, and he did. Shortly we had everything set up, and then we waited for the priest to arrive. There are few priests and many churches and people, and they are pressed for time. One priest may serve up to eight churches in one day. We were hoping it wouldn’t be the bland-faced cura who often stops us mid-song, and it wasn’t – it was the new priest, who is easy to read, and (so far!) easy-going, too. Right as we began the first song/canto, a large bus pulled right up behind our truck, and many men in uniforms got out. No, they weren’t soldiers or drug dealers. They were a band; a banda, with uniforms, instruments and sound equipment, and they traipsed right in front of us in a row in the street, to take their instruments to the other side of the entrance to the house/church. We continued the mass with no incidents. I wasn’t surprised, since I had read the wikipedia article about San Judas De Tadeo, when the priest admonished us all, after the mass had finished, that the children should not dress as witches, or La Santa Muerte, or devils, or zombies, but instead costumes should be of saints, or religious personages, etc. We were wondering how we would get out of the area. But the answer to that question was obvious – we couldn’t leave at all until the bus moved. And so it was that we stayed to hear a banda performance. (talk about a captive audience!) It may have been the worst live banda I’ve heard in Mexico so far. Take a listen. (I hope you can hear this. It’s my very first time converting this kind of audio file to an MP3). At least in this example, the tuba was playing generally in the same key as the rest of the band. The band played on, and I do mean on. We needed to move our truck because of the impending tower of fireworks, and so did the band. The fireworks guys who built the tower and strapped on all the fireworks (spinning wheels, sparkling flowers, shooting rockets, etc) stood there, at times shooting anxious looks up at the tower, the two big vehicles close to the tower, and other vehicles that were blocking us from behind. The band moved into a set of banda with vocals, even worse than the first songs. There were two men’s voices, each one thin. The lead voice sang close-to-in-tune (and those of You Who Know, know that sometimes is even worse than badly-out-of-tune singing), and the voice singing harmony, sang really, truly, badly out of tune, which sometimes created augmented chords instead of major and minor chords. 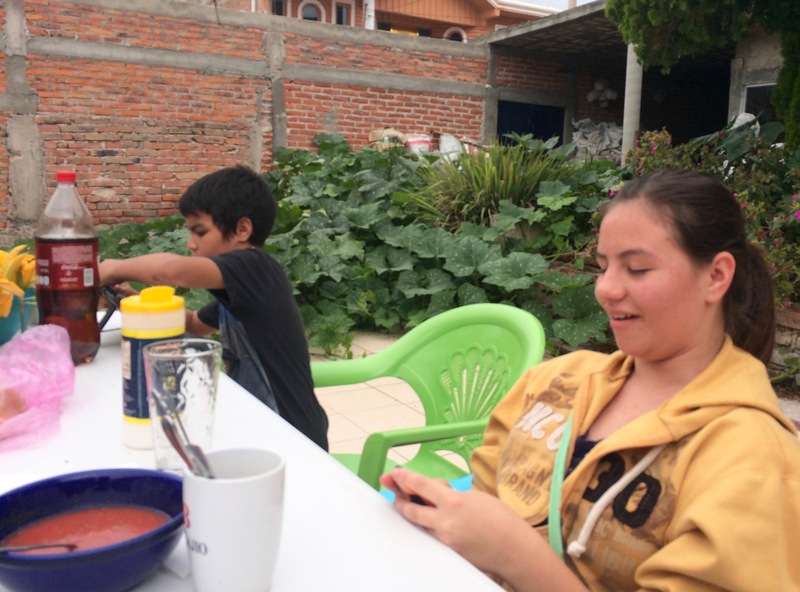 We bought some some excellent enchiladas from one of the women in front of the church/house. Well, we were hungry, and trapped in El Tecolote! How to make enchiladas for a crowd? They’re prepared on a very large disc with a bowl-like center that holds hot oil. One woman dips a tortilla in the sauce she has prepared, then dips the tortilla in the hot oil, and lays it on the outer edge of the enchilada maker. Another woman fills the red, soft tortilla with the filling of – mashed potatoes (! ), and rolls it up into its familiar enchilada-ish shape. When there are several, they are transferred to a plate, and the toppings are added. Thin slices of tomato and onion are layered on top with sliced lettuce. Then, on top of that, thin cream is drizzled over the whole thing, and then some green salsa. They’re very satisfying and delicious. By this time it was getting cold. I’m not exaggerating. I had already put on a light-weight blouse over my linen dress, and I wound my way through the crowd to get a long sleeved shirt from the truck. It wasn’t enough, but I felt a little more comfortable. It was the date of “falling back” from daylight savings time here in Mexico. We fell into bed late but uniquely satisfied. 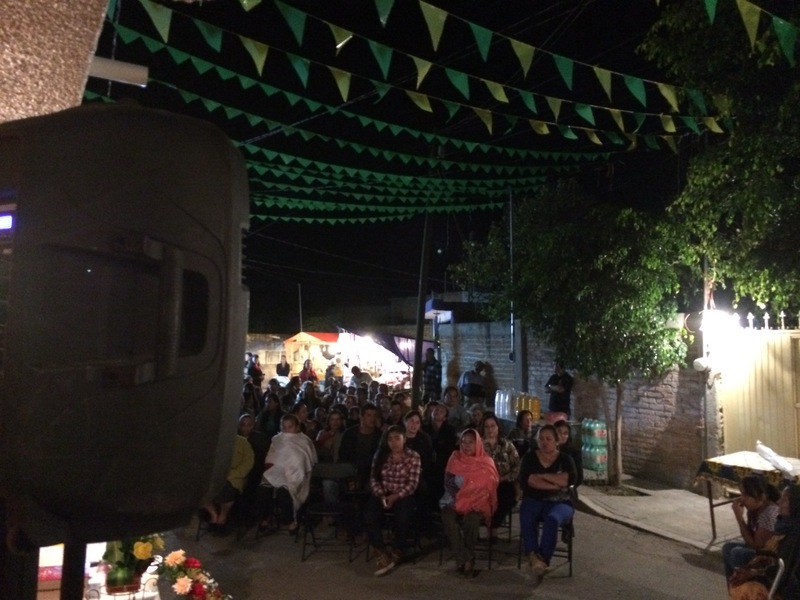 This entry was posted in ex-pats in Mexico, food in Mexico, gringos in Mexico, Mexican customs, Mexican food, parties and fiestas in Mexico, performing musicians, rancho life in Mexico, small town life in Mexico, Uncategorized on October 31, 2016 by gubabbaboy. We practiced! Yes, we did! For the first time in – no, I can’t say it. Just know that there were many, many reasons that other activities took precedence. It took several hours to locate all the equipment we needed, and to set up. We’re trying out a new spot in the portál. In this photo you can see our Audubon bird clock (very popular with the denizons of the rancho), some framed needlepoint work, our ancient electrical switch box and the place we hook up our musical electrical equipment, and a very old cement tile floor that I have grown to like. In the afternoon when we took a break, we went to survey the lot behind the house. On the other side of the stone fence is our neighbors’ corn field. For the first time in 6 years, the two middle-aged sisters have a respectable crop. Since the parcel slants down, and is dry land, the season was perfect – some rain every night. They also have some squash plants, tomatillos, and beans. I cooked a big handful of beans with lentils, and I must say that they were excellent. I had small hopes for them because the bean pods were beginning to dry. 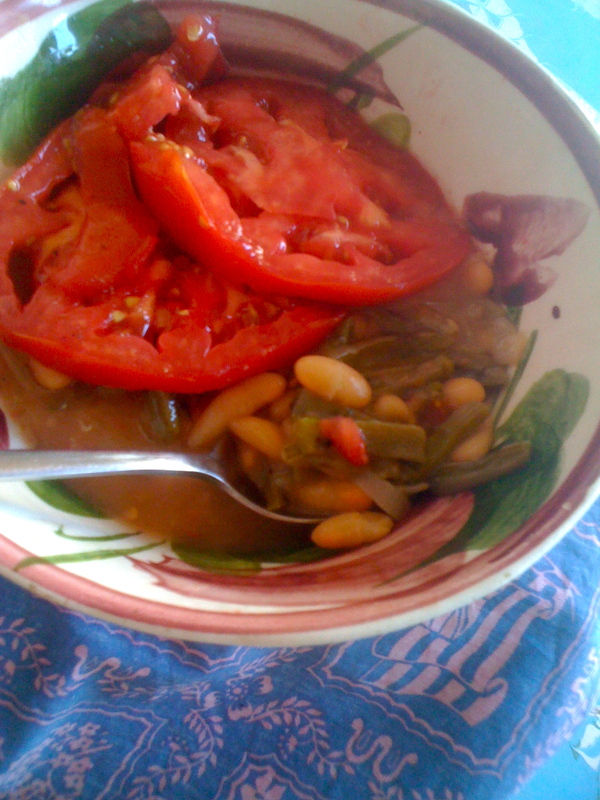 I shelled the driest ones to find tender, pale beans inside, and as for the greener ones, they soften right up, and the combination of legumes was delicious, cooked with onion, garlic and tomatoes. We had an excellent supper, served with bolillos. Our friends Michael and Richard headed home to the Los Angeles area today without us being able to spend time with them. Their Mexico vacation didn’t turn out quite as planned. In the afternoon I found some time to try to make up for lost time knitting. It’s beginning to look like a sweater! 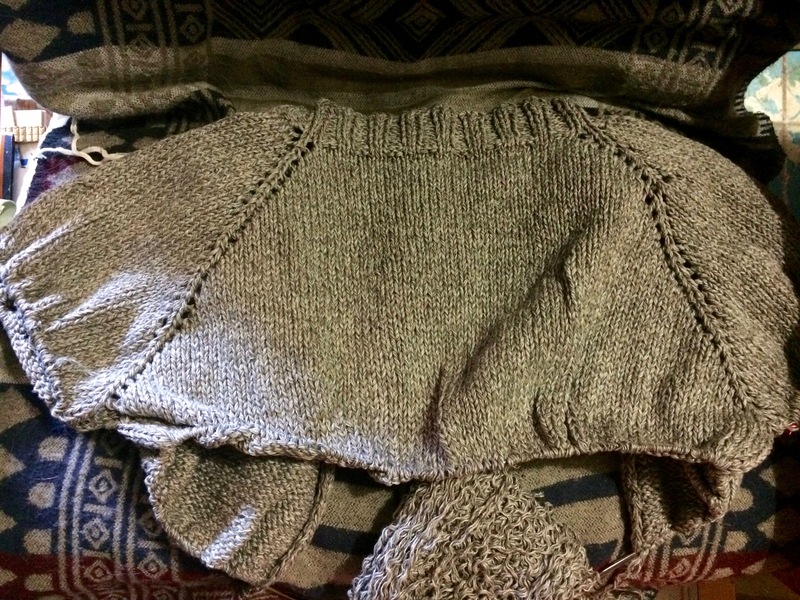 That’s the back of a short top-down cardigan knitted with recycled cotton yarn. And in the evening, more practicing! This entry was posted in cooking in Mexico, ex-pats in Mexico, farming in Mexico, food in Mexico, gringos in Mexico, growing corn in Mexico, Mexican food, performing musicians, rancho life in Mexico, retirement in Mexico, small town life in Mexico, Uncategorized on October 15, 2016 by gubabbaboy. Afternoon clouds behind the house. See that dark spot above the left high window? That’s a panál, a bee hive that’s getting larger every day. We both had been thinking about beef soup, Mexican style. It’s something that is cherished and admired by Chon. 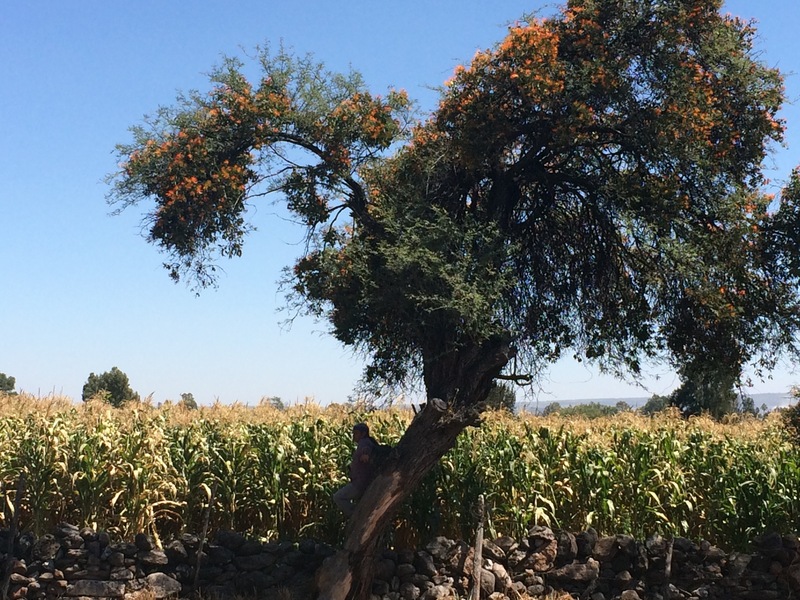 The corn is ripe, and it’s an important element in caldo de res. I had heard many times about the wonderful soups The Sisters made (and make), and I was a little intimidated and at the same time I was thinking “How hard could it really be?” I mean, really! Water, beef, carrots, celery, potatoes and any vegetable that appeals. So I decided to give it a try. In our rancho, beef is sold on Sunday mornings. I asked Elena if I could go with her when she bought her meat for the week, and she told me we’d go at 8 a.m. on Sunday. We walked to the corner where the vendors set up, and immediately I could see why the time was important. There were three people waiting in front of us, and the line grew and grew behind us. Elena said to buy about 3/4 of a kilo of ribs, costillas, and (I believe) cross cut hind shank or en español, chamorro. The meat was all beautiful, very clean, and being sold by two young women I had met by purest coincidence only two days before in nearby Jalpa. I had 20 pesos left from the 100 peso bill I had taken, and I bought 3 tamales from Lola on the way home, leaving me with 5 pesos left over. One hundred pesos these days is about $5.40 USD, in case anyone is wondering. The meat was the only thing I was wondering about. The beef here is not aged, and is therefore tougher. I bravely forged ahead, simply boiling the meat as instructed for over an hour with salt before adding the vegetables. I had some slightly sad carrots, nice celery, and some pre-cooked potatoes, and they all went into the pot. The meat was still tough. I worried a bit. After another hour the meat was less tough, and the flavor was excellent. i stopped worrying, kept the heat low, and kept it cooking. It was very good! I served it with some lovely slices of avocado, and a toasted roll, bolillo. 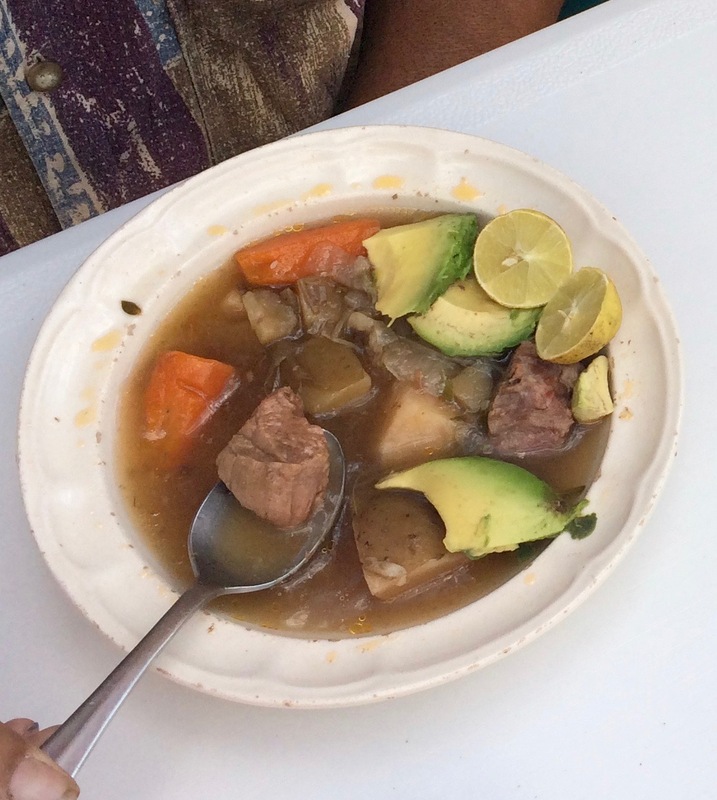 Chon was happy – caldo de res was probably made on few occasions while he was growing up. He asked for a second serving. Our untidy fall garden that still threatens to overtake the patio. if you read this far, won’t you consider subscribing to my tooky little blog? You could be the second person! It’d make me happy. 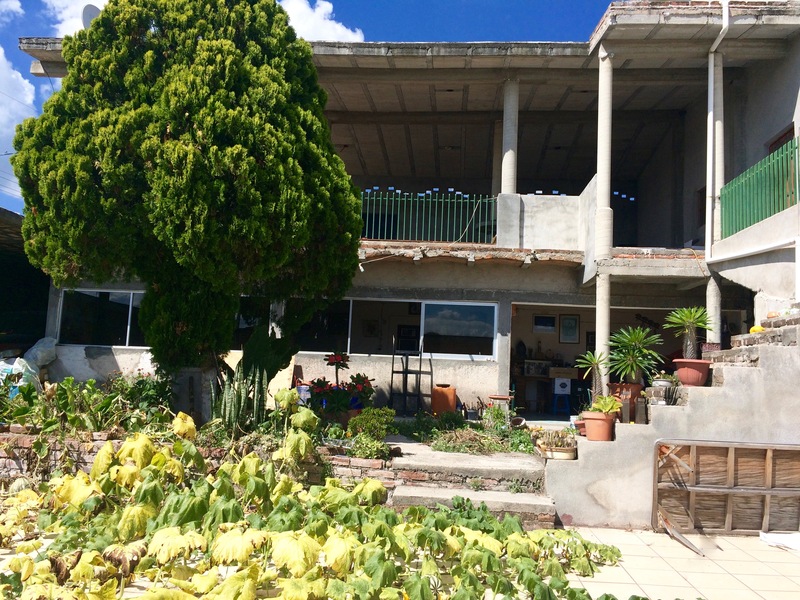 This entry was posted in cooking in Mexico, food in Mexico, gringos in Mexico, growing corn in Mexico, Mexican food, rancho life in Mexico, shopping in Mexico, small town life in Mexico, Uncategorized on October 3, 2016 by gubabbaboy. We had company this weekend. They are the very first and most likely the only people brave enough to come visit us and to stay overnight. Victor Vazquez is a first cousin and friend of ours, and he brought his two kids, Alex, eight years old, and Aria, thirteen. Victor became a single dad a little over three years ago, and moved with the kids to his family home in Mexico City where he grew up. The house ownership is in dispute among 13 siblings. They live there, though, pretty much avoiding the others who also live there. The kids have grown since we’ve seen them. Alex spent quite a bit of time using our big watering can that leaks (fun! ), and Aria was a bit shy at first but became more confident as the hours went by. When we heard that they were coming down from San Diego and San Julian we requested that they bring us birria, a favorite dish we haven’t had for quite some time. They not only brought birria, they brought other delectables the area is famous for. There was tequila almendrado, dark, sweet, and flavored with almond, and cajeta! From Wikipedia: Cajeta is a Mexican confection of thickened syrup usually made of sweetened caramelised goat’s milk. it arrived in medium-sized plastic buckets with lids, and it was absolutely delicious! I didn’t read the label, but I’m almost certain that this cajeta is made of cow’s milk. I was a dairy goat farmer for years, and can tell the difference easily. This morning we spooned some on yesterday’s bollios, the rolls we ate with the birria. They arrived yesterday before noon, and we ate the birria right away, then settled down to visit, which is always interesting. Victor is widely read, and has a lot of knowledge about many subjects, and of course there was the ever-fascinating family gossip. 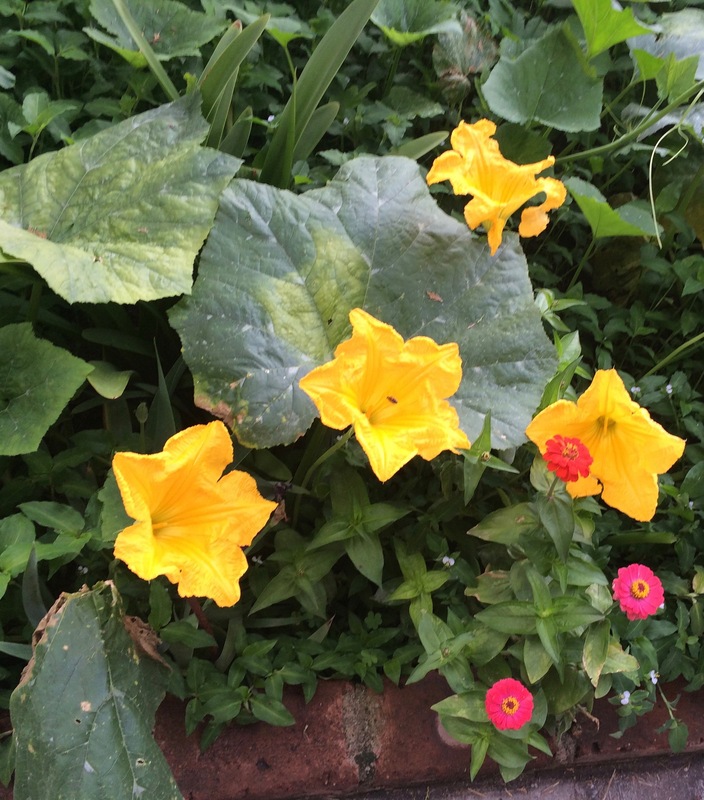 As they came in from the street Victor commented on the many large flowers our squash plants had, and said “We should make ratitas (that’s little rats, an unlovely name for a delectable dish). And in the afternoon when we got hungry again, we did. 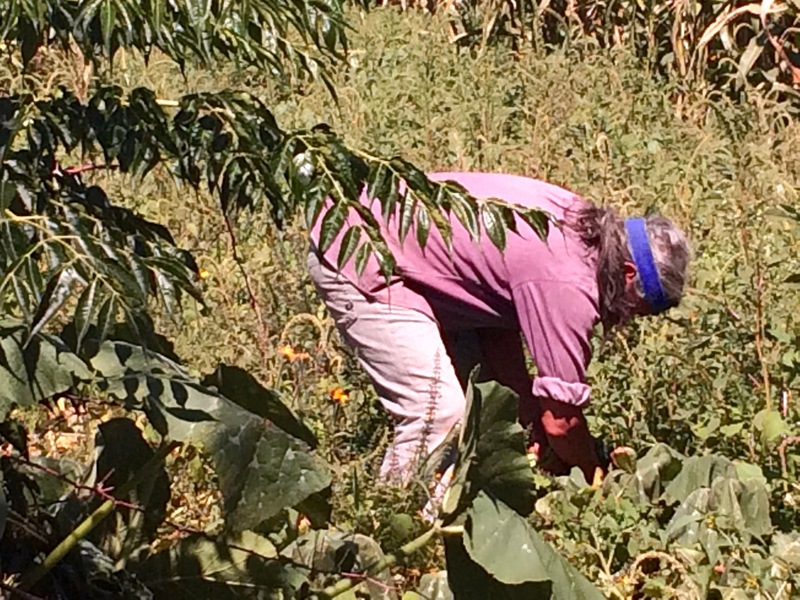 Chon had cut the flowers before they closed for the day, leaving 5- 6″ stems, the “tails” of the ratitas. At about 5 p.m. it was a team effort in the kitchen. Please excuse me if I write the recipe here, as choreographed by Victor. I want to remember, and perhaps entertain any cooks out there. Preparing stuffed flowers is very much like preparing chiles rellenos. A team effort makes it so much easier! When I make chiles rellenos I make a big, big mess in the kitchen. Ours looked like this, but with long green tails. 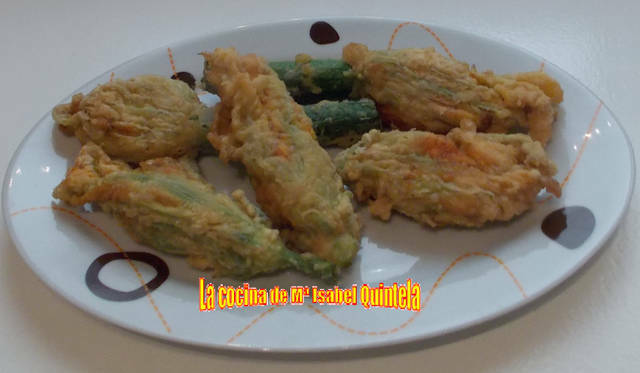 Nice photo from a recipe in Spanish by Chef M Isabel Quintela in cookpad. one-half pound of cheese, cut into slices, then strips (We looked for panela in the small store, and settled for asadero. Recipes I looked at on line suggested Mozzarella, goat cheese, ricotta, Parmesan, and others, and included herbs like basil and parsley. Sprinkle in a “handful” of salt. (granted, it was a child’s hand, but it was more salt than I expected, and it maybe should even have been a little more). Serve with flour or corn tortillas and salsa. When you bite into one of these ratitas it’s like having a cloud in your mouth. They’re just wonderful! Tender, with a delicate flavor. I’ve never read it, or heard anyone else say it, but the flowers have a very light flavor of anise. As the afternoon and evening wore on, it was entertaining to hear the talk flowing, and the kids were funny as they served up many riddles and jokes They know lots of them, all rapid-fire. Alex gets so amused that he laughs and laughs as he asks the riddles, which is infectious. They decided not to head to nearby San Francisco to stay with Victor’s brother there, and we prepared a bed for the kids and a couch for Victor. This morning I prepared an adequate breakfast of black beans, rice, salsa, zucchinis from the garden, and carnitas prepared right across the street, a Sunday treat. Along with bolillos, it was quite satisfying. Both of us enjoyed ourselves and I hope they did too. This entry was posted in food in Mexico, gringos in Mexico, Mexican food, small town life in Mexico, Uncategorized on August 7, 2016 by gubabbaboy. I like nopales. OK, they’re not for everyone, (their texture is a bit like okra) but I really, really like them. Our next-door neighbor Doña Elena has practically no income, but she enjoys bringing us little gifts, usually food. Last week she brought two glasses filled with red gelatin, and some nopales she had harvested and prepared herself. Yesterday when we were sweeping the street in the early morning she asked me how we liked the nopales. We had forgotten about them, I’m afraid, but I told her they were wonderful – very tender. Right after that I got them from the refrigerator and prepared them so I wouldn’t have to feel so guilty. Nopales are the pads of the prickly pear cactus, and they are low in calories and contain modest amounts of vitamins and minerals. I cut them into strips and boiled them. As they are boiling, nopales make lots and lots of bubbles, and you have to tend them so they don’t boil over. When they are cooked you drain them and cool them quickly, and throw away all the now-slimy, bubbly water. After they are rinsed they are not (so) slimy, and you can prepare a salad with them (with chopped onions, tomatoes and cilantro), or use them like a vegetable in main dish recipes. I asked Elena if she wanted to use them and she said yes. Today she cooked some very pretty flor de mayo beans – they are a pinkish pale yellow, and cook fairly quickly, and then she added the prepared nopales. And today i sliced the last two and served them with the beans and nopales, and toast. it was a wonderful meal! This entry was posted in cooking in Mexico, flor de mayo beans, Mexican food, nopales, retirement in Mexico on April 25, 2012 by gubabbaboy. A high-up colado being mixed on the street, and carried up to the fourth floor. For our last big colado we planned a sort of manly party. We wanted it to be festive, as it was the last big construction task here at our house, and the colado was an historic one, on top of a fourth-floor room. The colado was to have started at 5:30 a.m., but not even the maestros were here then. However we were on the move before 4:30 in the morning.. We had full barrels of water where they were not needed, and zero barrels where they were needed. We dumped buckets of water into barrels on the ground, from under the tejavan on the second floor. It felt rather festive, and personally, I felt slightly hysterical and silly. About 6:45 a.m. I could hear the first sounds of shoveling in the still-dark street. The workers seemed to have an air of excited energy, because they all knew there was to be “breakfast” served after the work. 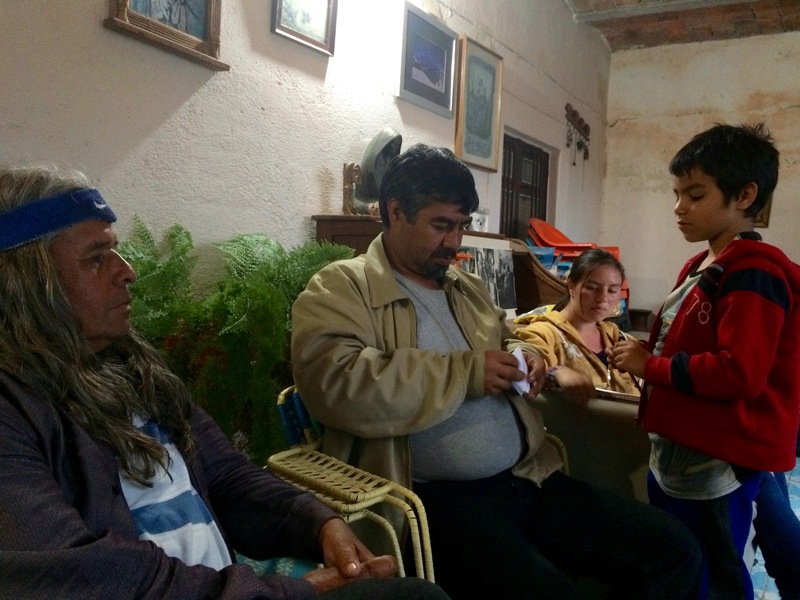 Our nephew Luis, a practiced butcher and large-scale cook had offered to make a Caldo De Carpa. 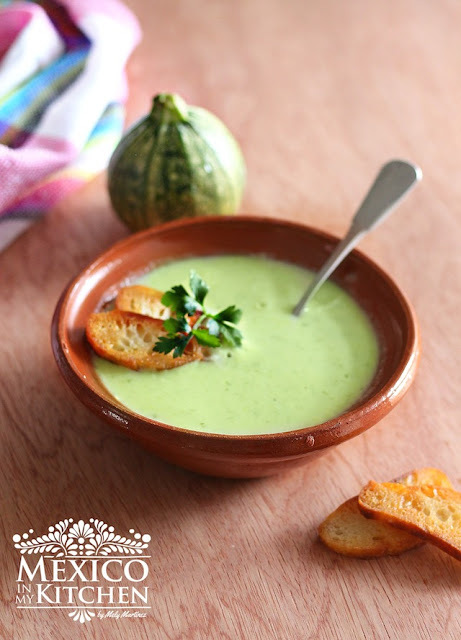 This soup has well-known restorative properties, and is often served for la cruda, or hangover. Sara, who didn’t really look quite this “together” on this day, as she had locked herself out of her house, and arrived here by bus the night before, without her overnight things, because – well, I have her spare key. While Chon stayed to manage the work crew (and play DJ for them) Luis and I went to a nearby town with Sara, our wonderful niece. Luis had set up a fogon, a little rigged up brick fireplace. We served 60 large rolls that all disappeared. We had purchased 2 kilos of tortillas that were pretty much ignored. There were also 24 large family-sized beers, and 4 liters of tequila. I had noticed that Luis was pretty quiet while we were shopping for provisions; he later confessed that he had never actually made the caldo before. He and Sara and I were stepping pretty lively for a while, chopping vegetables, because the colado was finished about an hour earlier than we had thought. But the workers seemed satisfied to sit around in circles and I didn’t hear many complaints about the wait. There were many rough handshakes and heartfelt thank-yous when the workers left around two p.m. 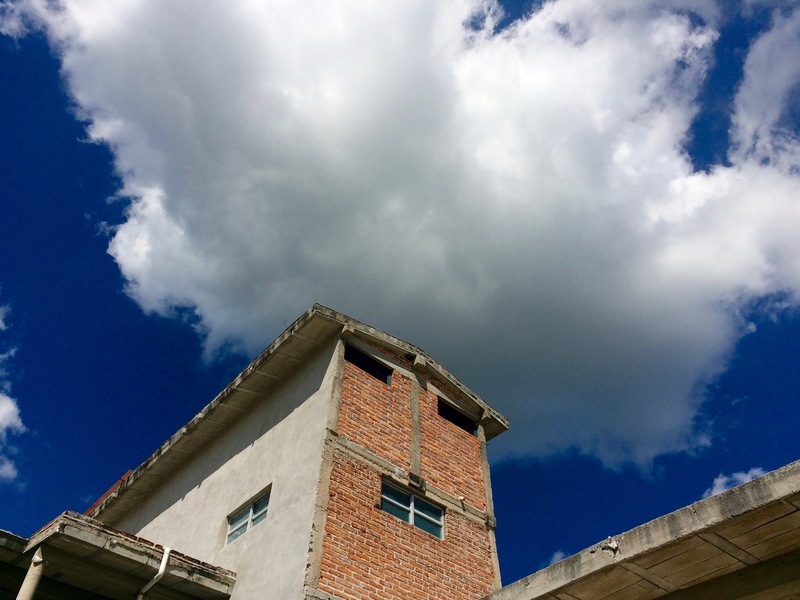 This entry was posted in house construction in Mexico, Mexican customs, Mexican food, retirement in Mexico on September 11, 2011 by gubabbaboy.